, a celebrated English divine, and master of Pembroke-hal in Cambridge, wns born in London, and educated in St. John’s college, Cambridge, of which he was chosen fellow in 1564. He was a youth of great parts, and of a very high spirit. When a boy at school, he is said to have betrayed great anger and mortification on losing a literary contest for a silver pen, with the celebrated Edmund Campian, and as the latter was educated at Christ’s hospital, this incident seems to prove that t’ulke was of the same school. Before he became fellow of his college, he complied with the wishes of his father, by studying law at Clirtbrd’s-inn, but on his return to the university, his inclinations became averse to that pursuit, and he was unable to conquer them, although his father refused to support him any longer. 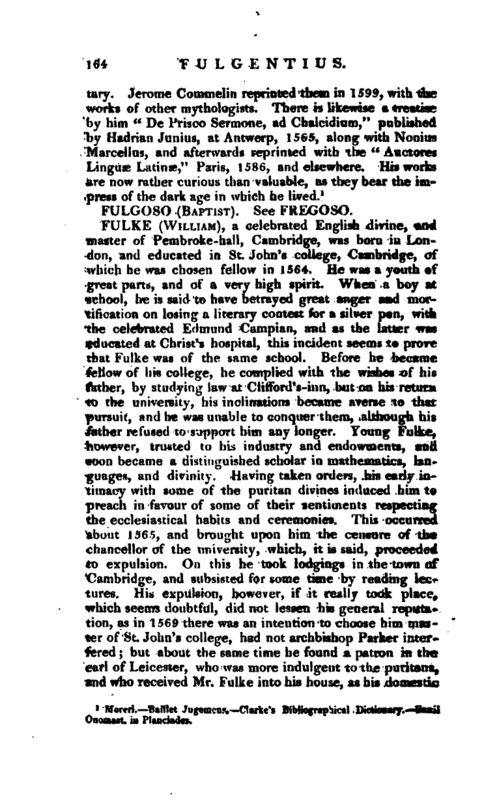 Young Fulke, however, trusted to his industry and endowments, and soon became a distinguished scholar in mathematics, languages, and divinity. Having taken orders, his early intimacy with some of the puritan divines induced him t< preach in favour of some of their sentiments respecting the ecclesiastical habits and ceremonies. This occurred about 1565, and brought upon him the censure of the chancellor of the university, which, it is said, proceeded to expulsion. On this he took lodgings in the town of Cambridge, and subsisted for some time by reading lectures. His expulsion, however, if it really took place, which seems doubtful, did not lessen his general reputation, as in 1561) there was an intention to choose him master of St. John’s college, had not archbishop Parker interfered but about the same time he found a patron in the earl of Leicester, who was more indulgent to the puritans, and who received Mr. luilke into his house, as his | chaplain. It was now also that he fell under the charge of being concerned in some unlawful marriages, and in such circumstances thought it his duty to resign his fellowship, but being honourably acquitted in an examination before the bishop of Ely, he was immediately re-elected by the college. In 1571 the earl of Essex presented him to the rectory of Warley, in Essex, and soon after to the rectory of Kedington, in, Suffolk, and about this time he took his doctor’s degree at Cambridge, and was incorporated in the same at Oxford. His degree at Cambridge was in consequence of a mandamus from the earl of Essex, that he might be qualified to accompany the earl of Lincoln, who was then going as ambassador to the court of France. Upon his return he was chosen master of Pembroke hall, and as Wood says in his Fasti, Margaret professor of divinity, but Baker, in a ms note on Wood, says he never held the latter office. In 1582, Dr. Fulke, with other learned divines, was engaged in a public disputation with certain Roman catholics, in the Tower, and had to contend again with his old school-fellow Campian, but was more successful. He died in the month of August, 1589, and was buried in the chancel of the church at Kedington, where is an inscription to his memory, partly in Latin, and partly in English. He was married, and had a large family, to whom he appears by his will to have been able to bequeath considerable property. 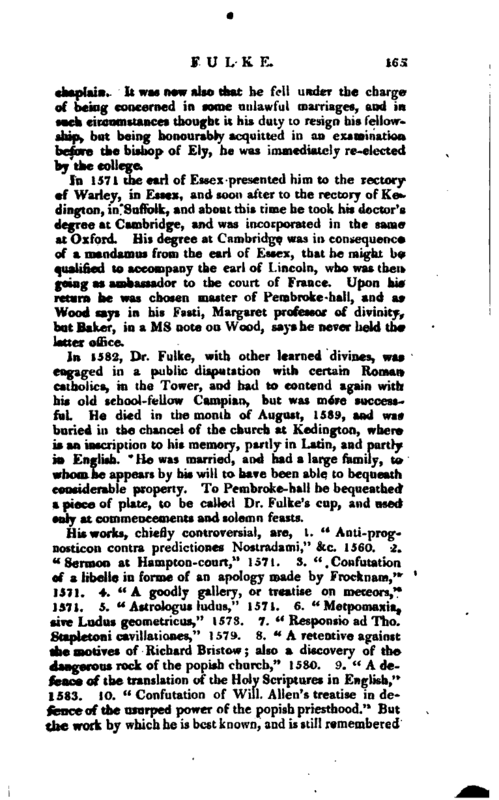 To Pembroke-hall he bequeathed a piece of plate, to be called Dr. Fulke’s cup, and used only at commencements and solemn feasts. 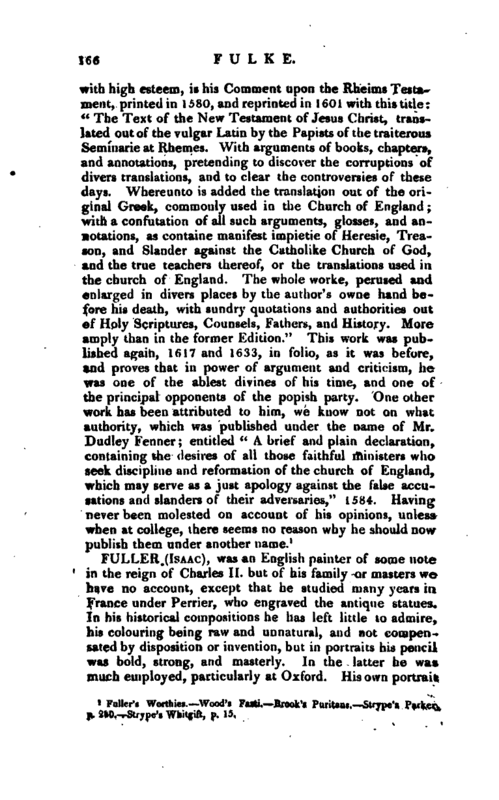 Fuller’s Worthies.—Wood’s Fasti.—Brook’s Puritans.—Strype’s Parker, p. 280.—Stryp’s Whitgift, p. 15.